Takeaway: Poor nutrition, be it too much or too little, or with an incorrect or incomplete nutrient balance, is a likely culprit of crop stress symptoms. Frank Rauscher explains how to detect the symptoms in your plants, and how to read a feeding chart. Gardeners know they need to feed their plants, not just water them. What to feed, how much and how often are answers that ultimately must come from the feeding chart for the type of nutrients they buy. When looking over the nutrient aisle there are a vast number of products to choose from and just as varied are the directions for feeding. 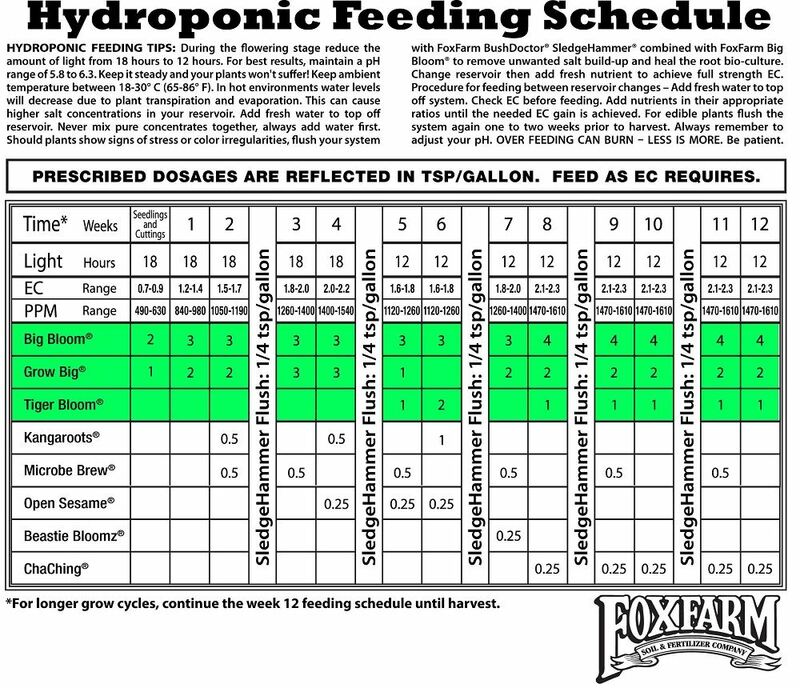 Be sure to find the feeding chart for your nutrient of choice so that you know what will be involved. Avoid overfeeding or underfeeding. Each different type of crop will have different nutrient requirements based on the genus and specie of plant, plant size, phase of growth and a number of important parameters of current growth characteristics. The better informed the grower is of these aspects and how they affect nutrient requirements, the better choice they can make toward optimal feeding practice. Fertilizers formulated for hydroponics (more commonly referred to as hydroponic nutrients) will generally vary the different formulas as the growth cycle matures. There are actually many reasons for varying the per cent of concentration for the many nutrients required. So, where might we start? Let’s take a look at a sample chart you might find provided by a manufacturer. As time progresses you will see the recommendations changing for the amount of various formulas added. 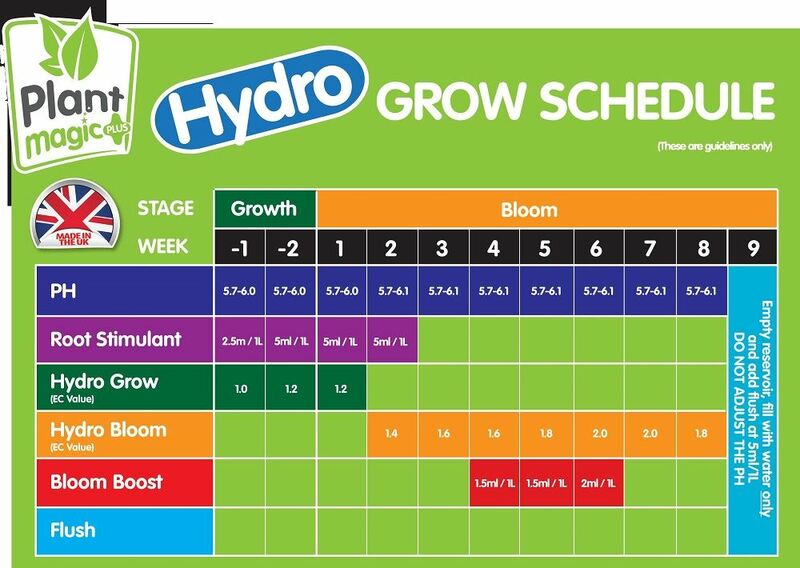 For the chart above the plant being considered in this example has a 12-week growth cycle before harvest. Most plants will take this long while some varieties mature more quickly. Some charts found online allow you to modify the number of weeks to maturity. In any case, find out how many weeks it will/should take your crop to mature and use a chart that reflects this. The nutrient formulas for these different phases of growth are designed to be best for the plant when it is in that phase of growth. Each of these plant phases will be listed along one line (vertical or horizontal) with the week number, while the various formula name brands are listed on the other line opposing line. Most charts are laid out by the week, but the nutrient amount listed should be given as called for in the feeding tips section (once a week, daily, etc.). As the growth phase of each plant varies throughout the cycle, the formula recommended is often varied. The richness of the nutrient solution will be measured by the EC or parts-per-million readings you take. If these readings get too high or low, adjust the amount of nutrient applied in order to closely match these concentration measurements. The electric conductivity of the reservoir nutrient solution will indicate the essential concentration of the fertilizer being fed. There are many meters on the market to help you measure this, and this measurement is likely to be one of the most important you make. The scientific parts per million of nutrient in the solution is a measurement of the dried weight of the residue in the solution in relation to the initial liquid volume. This is obviously laborious, and can be estimated by an EC measurement. There are conversion factors (internal to the EC meter) and these range from .50 to .72. Influent water contains undesirable dissolved solids that show up as PPM, so this needs to be considered when using your EC reading. If not specified in the brands feeding tips, reduce your range by your influent PPM. Often recommended in a chart are one or more rinse cycles. Rinse cycles are sometimes recommended the week before a new or different formula is to be started in order to help the new formula provide the strongest impact on the crop. Often a thorough rinse or flush is recommended a week or two before harvest to reduce the concentration of various nutrients from the consumable leaf of the plant before harvest. We can see that the hours of illumination are changing as the plant goes from leafy growth to bud and bloom. With many plants, the reduction of illumination hours can actually trigger them into blooming. By controlling the hours of illumination more accurately, you can help the plants mature and produce more quickly. There is a primary separation of instructions for any nutrient feeding chart. Why? Because the different concentration levels for the many various nutrients in each product demand substantially different feeding amounts. If the nutrient you use does not have an identical formula, you can’t assume that chart would work for your nutrient. Often discussed in the feeding tips section on a nutrient bottle are things like influent TDS and solution pH. At this point it is good to remember that the influent water may contain a TDS value of up to 800 ppm in Las Vegas and as low as 50 ppm in Seattle. Whatever the influent reading is, it needs to be taken in conjunction with the EC reading of the nutrient solution in making nutrient concentration levels. This is one reason why using reverse osmosis water for influent can be such a benefit in areas where the influent PPM is high. Some charts will state in the feeding tips area that the PPM recommendation is based on influent water of 50 ppm. (In this case 50 is only an example). There should be recommendations as to where to attempt to keep the pH level. Keeping your pH within the guidelines for nearly any feeding chart is going to be critical. You will need to be able to measure pH and have a good strategy as to how to keep the pH within the appropriate range. Depending on plant type, the concentration of any formula may need to be different or altered for various growth phases. Check to see the chart you use is reflecting the type of plant being grown. For example, plants that produce edible fruits (squash or tomatoes) compared those that produce an edible leaf (spinach or cabbage) should have different formulas. Another warning often included in a feeding chart is: “Do not pre-mix nutrients”. 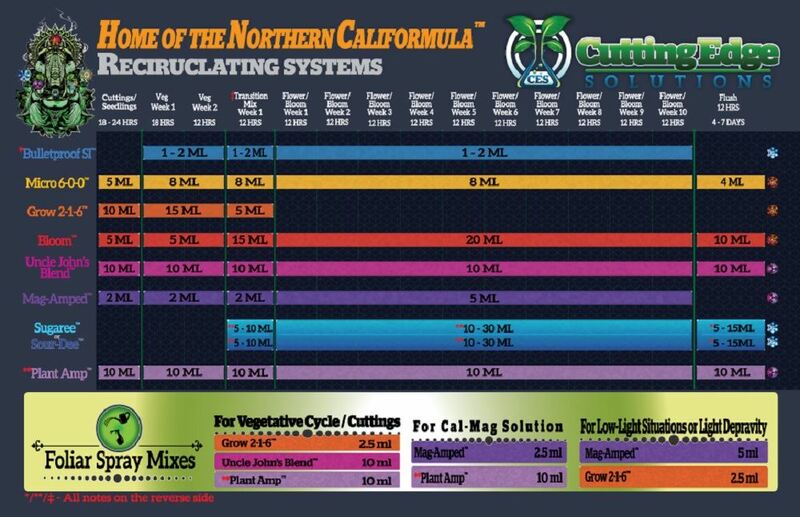 If you intend to use two different types of nutrient formulas, the chart for either one of these is going to be off because it does not contemplate the concentrations or quantities of nutrients being supplied from the other formula. To add a micronutrient formula to a macronutrient-only formula would most likely not be problematic, but mixing two different formulas containing the same nutrient is most likely going to cause complications. Charts are intended to be easy to understand and follow. In the case of recommending how much nutrient to add to a nutrient reservoir, the factors of pH and influent TDS must be considered and acted upon. Troubleshooting is often included in charts because there are signs the plant will give when the nutrient solution is either too strong or too weak. This is a very important observation as with each grow so many things can happen that will affect nutrient uptake. Inadvertent nutrient mixing errors, overwatering or underwatering, and pH issues are a few reasons. Watching for signs of trouble can help keep these things from ruining your crop. See Troubleshooting in the Hydroponic Garden for more advice on troubleshooting common problems hydroponic gardeners face.